Alien civilisation proven to exist on Mars! We are not alone! At one time an advanced alien civilisation existed on Mars, evidence suggests. 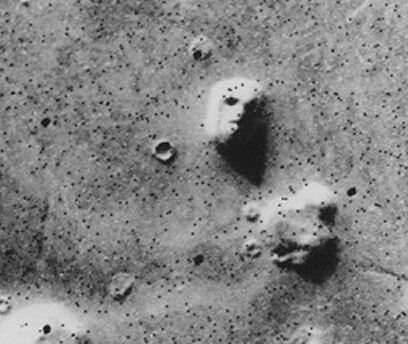 Space experts today told Eternal Vigilance that a pattern of shadows cast on a NASA photograph of the surface of Mars was consistent with a sculpture of a humanoid face left by an advanced civilisation that once inhabited Mars. The photograph above is of a small part of the Cydonia region, taken by the Viking 1 orbiter and released by NASA/JPL on July 25, 1976. Blogger Richard Goode, who made the link after reading internet blogs about Mars, believed his revelation was a “game-changer”. “I can’t explain why anyone would have missed something as obvious as this,” he said. No other evidence of life on Mars has ever been found.